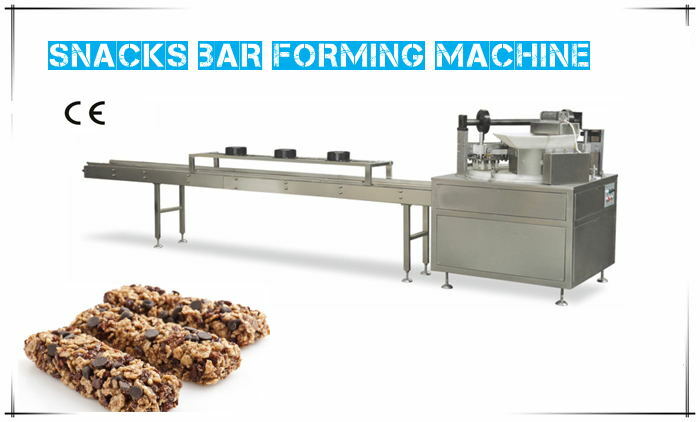 QL-360F Snacks Bar Forming Machine can be used for producing all kinds of cereal bars and sticks. ● Rotary structure which covers smaller area with high efficiency. ● The shapes can be round, cylindrical, square, semi round, triangular and blossom, etc. ● Mechanical pressing & rubbing, does not hurt nuts, without waste. ● Mechanical driving, accuracy positioning, upper and nether moulds tight fit, makes super cereal bar shaping. ● Using high performance frequency inverter, easy adjust speed, high efficiency, it can produce 24-hour continuously. ● Moulds and hopper are both non-sticky processed. All the parts may contacts food are all non-toxic material, oil and high temperature resistance. ● Cooling conveyor can be customerized as demand.